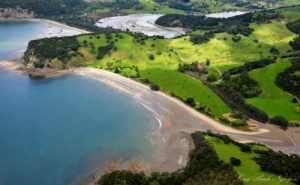 One of the most secluded beaches left on Auckland’s east coast will retain it’s “splendid isolation” as Auckland Council agrees no vehicle access will be developed through Te Muri Regional Park. Beautiful Te Muri beach is my favourite beach in the Mahurangi Regional Park. This beautiful, isolated beach is only accessible by foot at low tide because of the estuary, so the beach is often free of people: just you and the dotterels an it is easy walking distance from Mahurangi West Wing B&B. Te Muri to remain relatively undeveloped and retain its “splendid isolation”. During the 1970s, the then Auckland Regional Council bought the original 33 hectare Te Muri beach land as part of Mahurangi Regional Park. The council then bought the remaining 382ha farm in 2010. The relative remoteness of Te Muri, compared with busy Wenderholm and Mahurangi regional parks, will be preserved and enhanced. Over time the park will become a haven for campers, mountain bikers, walkers and eventually horse riding enthusiasts. 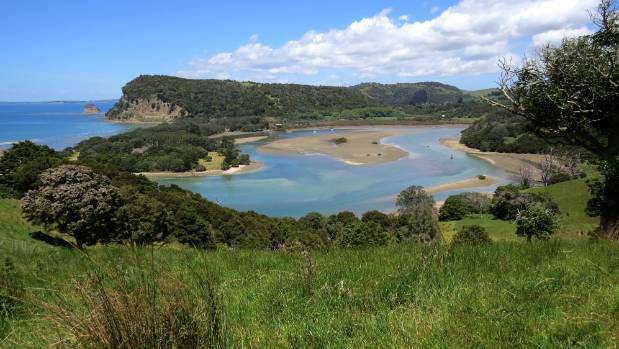 Plans for a Mahurangi Coastal Trail connecting Wenderholm, Te Muri and Mahurangi Regional Parks also got a step closer with council agreeing to look into boat or bridge access across the Puhoi river or overland access including to Puhoi village. While board walks and a small bridge across Te Muri stream will be looked at, the beach will remain free of vehicle access with the focus more on developing walking and cycle trails. There are also plans for horse-riding in the park but upgrading the intersection of State Highway 1 and Hungry Creek Rd and a parking area that can also accommodate horse floats will need to happen first, or other safe access has been developed. Walk the loop from our house and in just over an hour you’ll find 6 beautiful beaches that are just perfect for picnicking, walking or just sitting and taking in the view. For me, the highlights of the Mahurangi West Regional Park are the pohutukawa fringed Sullivan’s bay, pristine Te Muri. We look forward to hosting you at Mahurangi West Wing: luxury bed and breakfast accommodation on the park. We’re so close to Auckland yet a world away from the city! Want to come and stay? See if we have availability at a time that suits you. Origin of name: Maori for slow water – a reference to the tidal river that rules the town. Town slogan: Puhoi: Historic Village. Town origins: Settled in the 1860s by hardy pioneers from Bohemia, now part of the Czech Republic, the intrepid Bohemians were lured with the promise of free land. Hard slog ensued but the hardy souls proved more than up to the challenge. Look lively: One of Puhoi’s historic bullock teams featured a legendary fellow named Lively. Renowned for his strength, Lively was not always brave and, when pulling carts across the river, if eels rubbed against his legs he would leap into the air. Who wouldn’t? Set the scene: Puhoi village has served as a location for The Tommyknockers, Sylvia (the Sylvia Ashton Warner biopic), The Brokenwood Mysteries, Sea Urchins and Bridge to Terabithia. Main employer: Hospitality, tourism and that epic dairy darling The Puhoi Cheese Factory. Source of pride: The depth of respect for the town’s forebears, origins and heritage is palpable. Town fiestas: Stop in at the farmers’ market, held on the last Sunday of each month. Or head to town for June 29, when the arrival of the first ships is remembered with a bit of a knees-up. Here for a short time: Kayak on the river, visit the museum, browse the town and stop for a pint at the pub or a cuppa at Puhoi Cottage Tea Rooms. Kids love to: Spend the whole day playing by the river, or running around the spacious green grounds of Puhoi Tea Rooms where they’ll find an aviary, a bunny, chickens and a trampoline. Best park: Puhoi Pioneers Memorial Park has plenty of green space, including sports fields and tennis courts; right by the river there’s even a swing you launch yourself into the river from at high tide. Best facilities: Over the bridge, you’ll find well-tended bathrooms, a change table and a shower. Best walk: If you’re after a hefty hike, Puhoi is on the Te Araroa Trail and the Arthur Dunn Bush Track is a 5km beauty. Or simply trot along the loop walk: a 40-minute round trip, it starts with a bit of a climb but you’ll be rewarded with magic views of the countryside and picturesque town. 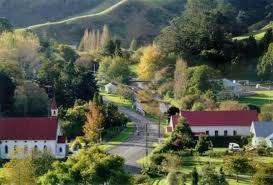 Best place to pull over: Stop at the Puhoi Pub or The General Store, enjoy a beverage and watch the world go by. Best swim: Pop along to Wenderholm for beach or estuary dipping, or, when the tide is right, join the local kids who jump off the bridge all summer long. Best museum: Tended by dedicated volunteers, The Bohemian Museum is a labour of love preserving the pioneer heritage. Learn about the first European settlers who worked hard, prayed hard and kicked up their heels to jaunty folk music. One chap, Benedict Remiger, was just 12 years old when he set off alone, without family or friends, to make Puhoi village his home. Walk the walk: Take the town’s self-guided heritage walk and admire the darling old buildings. Brochures available at museum. 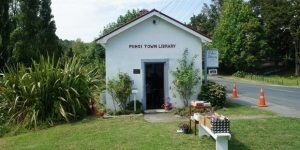 Book it: The tiny Puhoi Library is cute as a button, built in 1913, more than 6000 visitors stop in each year. And there are always books for sale. More than 6000 tourists visit the tiny Puhoi Village Library each year.Library each year. This bead of light: Visit Inge Chappell at Kleurglass, where she gives lessons and demonstrations in the mesmerising art of bead making. Or visit her gallery in Warkworth to admire the full range of her wares. Top shop: The General Store is like entering a Tardis, selling more than just regular old groceries, fruit and vegetables, it also stocks a range of delicacies including pastries, cakes, pies, sandwiches, bespoke pasta and coffee. They also serve as the local post office and do oysters and chips for just $10. Gifts galore: The Trading Post is where you’ll go for Native American crafts, including reindeer pelts. Next door, The French Shed sells French provincial wares. Further along the main drag, poke your nose into The Trove, home to all sorts of arty gems, including a taxidermied winged piglet. Cream of the coffee: The General Store does a mean brew. Teatime: The Puhoi Cottage Tearooms offers a menu of more than 30 terrific teas, some of them truly exotic. Baked: The General Store’s cake and pastry selection is epic, ditto The Puhoi Cottage Tearooms where baked treats are lovingly homemade and include plenty of dairy and gluten-free options. Uncle Larry’s Jamaican-style pies are also tasty. Holy cheeses: The Puhoi Dairy Company is like a shrine to cheese and it’s also a fabulous eatery – the macaroni cheese is crazily tempting, as are their award-winning ice creams. Plus there’s a playground and plenty of space for letting off cheesy steam. Best food: The Puhoi Pub provides hearty grub including nachos, burgers, seafood chowder and dandy mussel fritters. The aforementioned Puhoi Cottage Tearooms is also charming for breakfast or lunch; on a rainy day you could make yourself at home there for some time, gazing out at the gardens. Wet your whistle: Kick back at the Puhoi Pub for as long as you dare and, considering they do accommodation, why not spend the night there too? Comfortable and quirky, the hotel was established in 1879 and is bursting with memorabilia and curiosities, old photos and archaic tools. Best adventure: Be sure to kayak the river to Wenderholm – or up the other way if you’d rather – Puhoi River Canoes make it all so easy. And, if the tide isn’t in your favour, pop along to Mahurangi Regional Park 15 minutes’ drive away. Wildlife: Ducks, possums, pukekos, eels and plenty of native birds. The cormorants and herons aren’t bothered by humans and photographers often snap fabulous pictures. The verdict: A Bohemian rhapsody. Looking for a weekend getaway from Auckland. See if we have availability at the time you’d like to escape. Auckland has plenty about it to love, but sometimes we all need and Auckland escape; to get away from the big smoke. If you’re already considering a mid-winter break but don’t want to break the bank, then a stay-cation rather than a vacation may be just the thing. And one of the great aspects of Auckland, because of its huge sprawl, is that there are some secret little corners that will make you think you’re not in Auckland anymore. Stuff have put together a list of favourite spots on the fringes of the city, which will provide you with a getaway, be it just for the day or an overnighter. 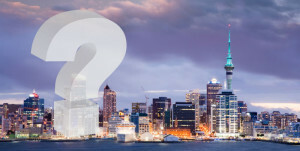 Either way, they’re guaranteed to show you a new side of Auckland and recharge your batteries. Looking for somewhere to stay on your Auckland mini-break? See if we have availability at the time you’d like to escape. 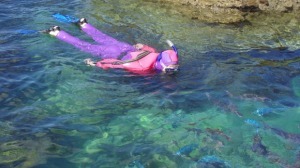 Snorkeler surveying fish at Goat Island Marine Reserve in Leigh. With pristine waters and friendly fish, the marine reserve of Goat Island in Auckland’s rural north is a world away from the hustle and bustle of big city Auckland. Though a dip in the water may not sound like the ideal holiday for a mid-winter break, the locals say its the perfect time to visit, with the weather conditions making for the most crystal clear waters. You can tog up in a thick wetsuit provided by the local rental snorkelling shop, or if you really don’t want to get wet there are kayaks or a glass-bottomed boat offering 45-minute tours of the marine life. And then drift back to Leigh for a meal and a hot toddy. You can make it a day trip or stay at our B&B to make a weekend of it – and check out some of the other local attractions. Goat Island is about 40 minutes’ drive from our bed and breakfast. Mahurangi River winery is one of the finest of Matakana’s selection of vineyards. So fins and a wet suit are not your cup of tea. Maybe a glass of pinot and a cheese platter is more your style. No problem, the north can cater for your tastes too. 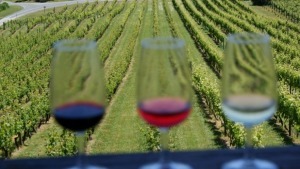 A mere hour away from Auckland’s CBD a sprawl of vineyards and cafes awaits you. With plenty of accommodation, such as our B&B, you can easily extend your stay it into a weekend getaway. Enjoy the Matakana Farmer’s Market which takes place every Saturday and Sunday with a spread of fresh produce and great lunch food. We’d highly recommend the buffalo burgers. There is also a quality ice cream shop and a gallery of local arts and crafts to bring some of Matakana home with you. Kawau is surrounded by clear blue water. Auckland is a city of cars (and congestion and interminable traffic light delays at times). So where better to get away from Auckland without leaving Auckland than go where there are no cars. 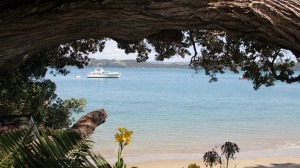 Get out onto the Hauraki Gulf and try Kawau Island, accessible only by a ferry or a water taxi from Sandspit – 25kms from our B&B. Once you’re there we guarantee the big smoke will be well out of your mind. Take a walk along one of the Island’s many tracks, visit the Mansion House to dabble in some history and if your budget allows, stay in one of the Island’s cottages overnight. Bike, swim or lick an icecream at this beachy paradise, writes Elisabeth Easther. If you’re looking to stay a little longer that the afternoon, you’ll need a B&B near Orewa. See if our room is available at a time that suits you. Our bed & breakfast is about 17kms north of Orewa. Where is it? On the Hibiscus Coast, just 40km north of Auckland’s CBD. Origin of name: Named for the native tree, the rewarewa, over time it was truncated to Orewa. Tunnel vision: When the Northern Gateway Toll Road opened, Orewa was no longer on the main road heading north; the place is so much nicer without all that traffic. Grab a selfie: Take a holiday snap with Sir Edmund Hillary. Sculpted by Chen Wei-Ming, the statue was erected in Hillary Square in 1991. Town fiestas: The Orewa Big Dig is a charming Lions fundraiser held each summer and the Santa Parade is also groovy. The Saturday morning farmers’ market is another good reason to visit. Plus there are plenty of cultural and sporting events throughout the year. Here for a short time: Ride a bike, go for a swim, lick an icecream, and admire the 3km of heavenly beach. Best time to stop: Of course it’s dandy during the height of summer, but it’s also popular in winter and particularly invigorating during a storm. Who lives here: Orewa is all the rage for retirees and young families looking for a more laid-back life. Kids love: The beach, the icecream joints and the holiday programmes at Estuary Arts. The new-ish skate park beside the estuary is an amazing facility although it’s more for serious skaters than beginners. Best parks: Orewa is bursting with open green spaces, wetlands and that glorious beach. Further up the road, Wenderholm Regional Park is another phenomenal place to explore. Best playgrounds: There are several playgrounds dotted along the seafront including a boat-themed area for juniors with swings and tube slides as well as other more sophisticated facilities with climbing and spinning paraphernalia. Volleyball and basketball can be played right by the beach. Best walk: Immerse yourself in bush and birdsong at Alice Eaves Scenic Reserve on Old North Rd. With about an hour’s worth of tracks, loops and A to Bs, the mature kauri and nikau, with peeps of sea between their trunks, tower above elegant boardwalks and, if you go at night, you’ll see glow-worms. Best views: Anywhere out to sea is pretty special or park yourself upstairs at Brew Bar and toast the sunset. If you’re a lark, rise with the sun for some spectacular colours. Best place to pull over: Heading north towards Waiwera you’ll find a viewing platform on the sea side of the road. 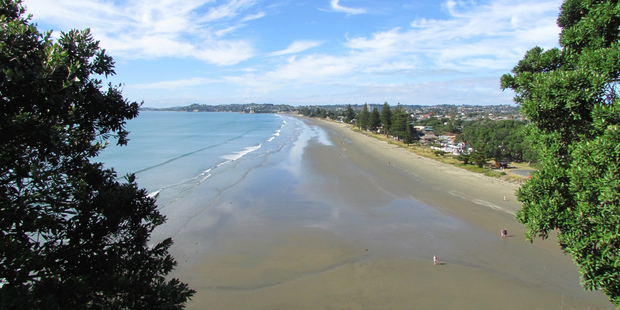 Climb the stairs and gaze down on the length of Orewa Beach. Best swim: All along the coast is epic with plenty of room for everyone to have their own little spot. The waves are mostly gentle, although they can kick up in some conditions, while over at the estuary there are lots of safe paddling spots for juniors. And, of course, between the flags outside the surf club is the sensible spot. Best hot pools: Waiwera’s geothermal mineral pools range from cool to 48C, plus there are private spas, a lazy river, a movie pool and some seriously speedy hydroslides, so make sure your togs are tied on tightly. Best museum: Neighbouring Silverdale’s Pioneer Village is where the history buffs go to learn about the region’s past. Nice arts: The Estuary Arts Centre is a gorgeous gallery with shop, teaching unit and school holiday programmes. Pretty things to gaze upon and buy. Top shops: Animal Natural Health is a fab place to get affordable wholesome pet food. Their offal-rich kitty mince is a huge hit with our feline friend. Or for something more fragrant, stop in at Flowers by Joanne, divine aromas, bouquets and gifts. Cream of the coffee: Driftwood Cafe at the art centre can be relied on, plus their quiches, cakes and sausage rolls are tasty too. Other good coffee joints includeMozaik, Walnut Cottage Cafe, and the BP station. Baked: Le Croissant is a French bakery selling the most delicious croissants, bien sur. Best food: Coast Bites and Brews does delicious food with one of the finest views in town. They serve Deep Creek beers — highly recommended by the Travel Editor — and it goes off of an evening if you’re that way inclined. Tuesday night, it’s all you can eat ribs. For wholesome snacks, salads, juices and smoothies, check outCharlie Coco’s. Kotare Bistro at the surf club is also grand if you’re fond of seafood beside the beach. Wet your whistle: Aside from Coast, another heavenly sipping spot is the top deck of Orewa Surf Club. Bliss. Best cycling: Hire a bike from BikeMe for just $10 an hour and cycle the fabulous Te Ara Tahuna Pathway, a 7.5km loop around waterways and wetlands and almost all off-road. Mostly flat, cyclists of all ages will enjoy this. Wildlife: The bird life is plentiful but don’t give the seagulls a single morsel if you’re fish and chipping on the beach, because you will be swamped. Safety warnings: With a busy-ish road between town and the beach, do be careful when crossing, and drive slowly if you’re passing through. The verdict: A little slice of paradise just 20 minutes from the Auckland Harbour Bridge. Novice kayaker Debbie Griffiths and kids go down a lazy river. The six-year-old seems a little bemused when he glances back at me from the front of the kayak. It turns out Nate had been keeping his serious misgivings about this adventure to himself. We’ve already exceeded his low expectations of our kayak trip by remaining inside the vessel. A 20-minute drive from our North Shore home gets us to the rural settlement of Puhoi on a crisp, clear Saturday morning. This historic community was originally settled by people from Bohemia in the mid-1800s on the promise of free land, Kathy Mankelow’s ancestors among them. After a stint working overseas, she returned to the settlement 22 years ago with husband Cody to begin their own family. They set up a weekend kayaking business from their home, which backs on to the river so that Kathy could stay at home while the kids grew. “It got so busy that it quickly became full time for both of us,” she explains. 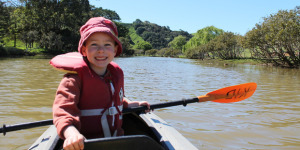 Puhoi River Canoe Hire is now popular for corporate team building days as well as for day trippers, tourists and families with children aged three years and up. Cody tells me it’s the repeat business that makes it particularly satisfying. It’s a friendly and warm family operation and the years of experience mean it’s a well organised, tidy set-up without that sterile “sausage factory” feel. When we arrive, several other groups are being briefed about the route they’ll take down the river, which includes a map and helpful photographs. Others are being fitted for lifejackets and shown the correct way to paddle. Puhoi translates to mean “slow water” and that’s the big drawcard for families. It’s a safe 8km-long glide down towards the coast with the outgoing tide. More experienced paddlers are encouraged to paddle up for a kilometre first to see Puhoi township or to branch off to explore Hungry Creek River before doubling back to continue on to Wenderholm Regional Park. Our family has booked two double kayaks and are advised to paddle upstream first to get a feel for them so that we can easily return to get any problems fixed on our way back past headquarters. Husband and 10-year-old Asher are confident and soon disappear around the first bend with Nate and I close behind. Birds, the splash of the paddles and the breeze in the trees are the only things we hear as we watch the changing landscape. Crowded overhanging willow trees soon thin out and the river widens as we pass green paddocks dotted with cows. As we near the estuary, we see the mudflats. Asher has spotted a pair of herons gliding across the river to land on the bank ahead of us. That begins the game of “what bird do you see?” in which Nate scores big with ducks, a kingfisher and a circling hawk. It’s not long before we’re approaching the bend in the river that runs underneath then alongside State Highway One. On a day when feeling “at one with nature” was the main aim, this close proximity to modern life is the part I was least looking forward to. The traffic, though, is a mere murmur and gliding under the road bridge proves fascinating to all of us. After that, the passing cars are forgotten and we’re back to studying crabs on the marshlands and discussing likely homes for crocodiles and other deliciously ridiculous things that young kids and parents chat about when there’s no homework or after-school activities to rush off to. I’m surprised that despite the dozen or so other kayakers who were being launched into the water when we arrived, we hardly ever see anyone else. The peaceful river is ours. Older child, Asher, is enthusiastic about WaterWise lessons in school and now takes the chance to relax with her feet over the side while dad paddles. Nate – who’s revealed himself as a nervous Nelly – has been given a kid’s paddle that doesn’t need to be turned and now feels confident enough to dip each side into the water. The double kayak is easy for me to paddle and control thanks to the rudder. Another dad is assisting his daughter with a tow-rope attached to his single seater. There are options for everyone to enjoy the day. One woman I chat to afterwards had not paddled before and is thrilled by the experience. “That was so lovely,” she says. Kathy agrees it’s the perfect introduction to kayaking for beginners. “The river is so slow-moving, it’s considered safe enough for customers to go down by themselves,” she says. About two hours after setting off, we reach Wenderholm. We’re helped out of the kayaks and given a ride back to our vehicle in Puhoi. We have packed a picnic but the historic Puhoi Pub is also an option for lunch – it’s just steps from the Canoe Hire property and has plenty of tables out front where kayakers can eat and drink in the sun. I find it’s sometimes difficult to gauge whether kids have enjoyed a new experience but, in this case, it proves easy. Puhoi River Canoe Hire is open daily from September 1 until June 30. The river is tidal so bookings are essential to ensure your kayaking adventure coincides with the high tide. Contact Kathy or Cody to find out the best time for the date you’d like to go out. Need bed and breakfast accommodation and a quick break? Puhoi is just two kms from the end of Mahurangi West Road and paddling the Puhoi River is a great way to pass a few hours while staying at our B&B at Mahurangi West.